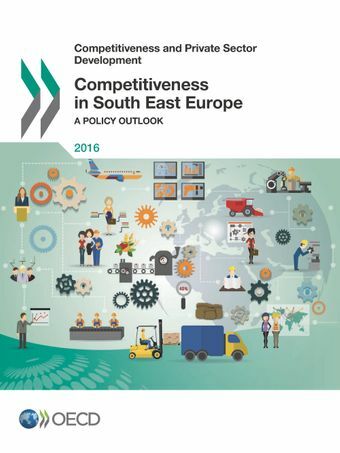 Future economic development and the wellbeing of citizens in South East Europe (SEE) depend more than ever on greater economic competitiveness. To underpin the drive to improve competitiveness and foster private investment, an integrated policy approach is needed. This first edition of Competitiveness in South East Europe: A Policy Outlook seeks to help policy makers in Albania, Bosnia and Herzegovina, the Former Yugoslav Republic of Macedonia, Kosovo, and Serbia assess their progress towards their growth goals and benchmark them against the good practices adopted by OECD countries and the performance of their regional peers.This report addresses 15 policy dimensions critical to competitive economies that draw on the South East Europe 2020 Strategy (SEE 2020), a regional growth strategy drawn up by the Regional Cooperation Council and adopted by SEE governments in 2013. The qualitative assessments presented herein use scoring frameworks to enable regional comparisons. A participatory assessment process – that brings together regional policy networks and organisations, policy makers, independent experts and the private sector – ensures a balanced view of performance. The purpose of the launch event for Competitiveness in South East Europe - A Policy Outlook was to present the main findings of the publication and discuss key recommendations to enhance Competitiveness in South East Europe. It brought together representatives from the OECD and the European Commission, as well as high-level government officals and key policy stakeholders from the region.